This tab is used to define the type of particles to be used. The Source popup menu is used to select either a default particle (circular with an opacity level decreasing towards the edges) or an image of your choice. When required, the image may be a brush, animated brush or current project. In the case of brushes, you may select it using the file requester. Opposite, use of the default particle. The Anti-aliasing option allows you to finalize the general aspect of the particles. We have already discussed this when studying the drawing tools (lesson 4). The Handle menu works in the same way as that encountered when studying the brush and animated brush tools. It defines the particle axis which is the reference axis when a spin is imposed on the particle. You may choose a handle located in the center of the particle (more precisely, in the center of the HUD rectangle surrounding it) or in one of the four corners of the latter. As a last resort, you may even place the handle manually. The Handle is also used as a reference point when calculating collisions. Furthermore, if you need to calculate a collision, it may be wise to place the handle elsewhere than in the center of the particles in order to obtain better results (see diagrams below). - The None option authorizes display of the AnimBrush's first frame only. 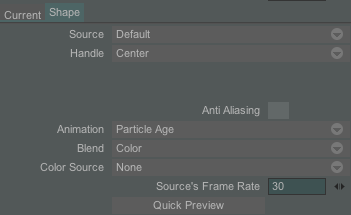 - The Once option is applied to each frame of the animated brush one after the other and stops at the last. - The Loop option is also applied to each frame of the animated source one after the other, but starts a new cycle each time it reaches the last frame and so on until the particle dies (see predefined example: objects > coinfountain). - The Random and Loop option randomly selects a start frame amongst the frames making up the animated source, then repeats these source frames in order starting from the selected frame. When the source footage has come to an end, it starts again (see predefined example: cartoon > eyes). - The Ping pong option is used to first repeat the animated source frames in a rising order. Once the last frame is attained, it repeats the frames in a descending order and so on until the end of the particle lifespan. - The Random option is used to display the animated source frames randomly. - The Random at start option is used to display the animated source frames randomly for each particle, and then to keep it until the end of the particle life span (see predefined example: objects > tetris). - The Particle age option varies the source frame displayed according to the age of its particle. All animated source frames are displayed once during the particle lifespan. - With the Particle direction option the animated source frame chosen depends on the direction of the source in space. A coin thrown into the air, for example, will show one side on the way up and another on the way back down to the ground. - With the Generator's direction option the animated source frame chosen depends on the angle formed between the particles generator and the horizontal plane (see above in the chapter Emitters tab with examples line, point, rectangle or ellipse). 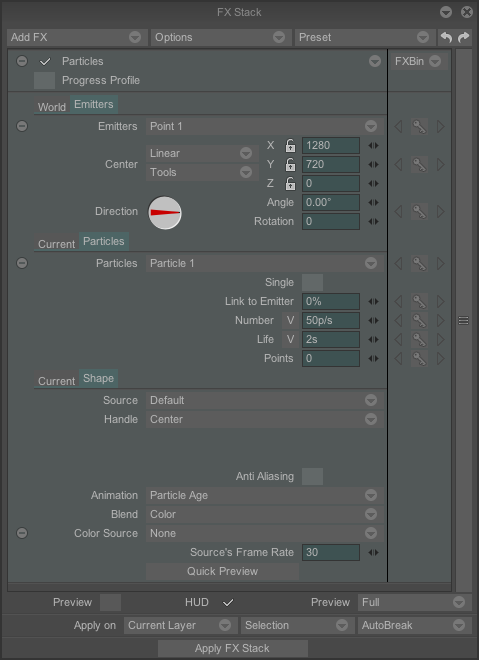 - With the Emitter direction option the animated source frame chosen depends on the angle formed between the particles emitter and the horizontal plane (see below in the chapter Emitters/Current tab). The Blend popup menu is used to choose the mode to be used when drawing the particles on the screen (color, behind, erase, etc…). Refer to the predefined example (nature > sun) for an example of how to use the Add mode. In lesson 4 you were given a detailed description of the drawing modes available in TVP Animation. - The Color option is used to give a tint of your choice to the particles (use the Color box and Alpha parameter). An Alpha value of 100% will totally change the natural color of the particles. - The Gradient option is used to modify the color of particles emitted based on a color gradient (refer to the predefined examples: party > fireworks or misc > worma). - The Mode menu contains some of the options already seen in the Animation menu above. However, these options do not apply to all consecutive elements of an animated brush, but to the colors of your particles in accordance with the color gradient chosen. The color gradients chosen to be applied to your particles will depend on the choices you make in this menu. In the example (party > fireworkscold) the particles' color covers the entire color spectrum of your particles for as long as they live. In the example (party > stage lights) the particles' color is chosen randomly and kept as long as the particles live.